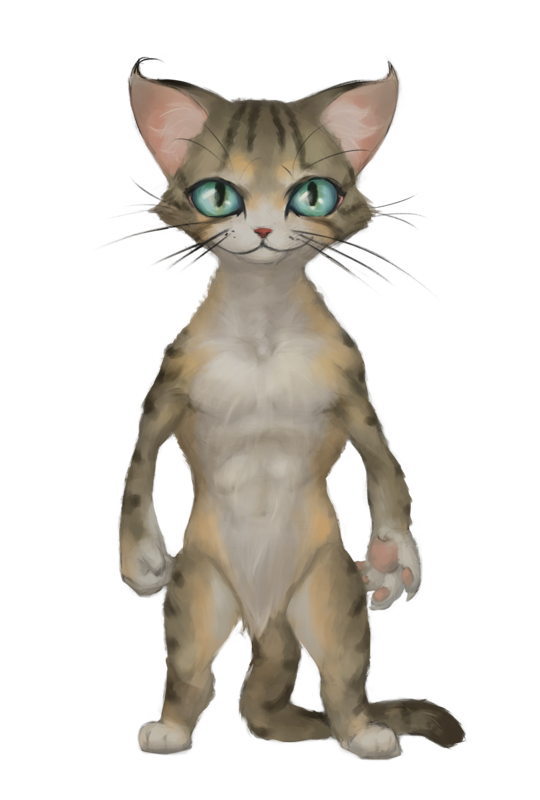 Thirvolans are a small catlike race originally from the sunken continent of Kal. Now they can be found traveling the lands of Tharstelding, or floating atop the oceans in their vibrant cities of lashed together boat homes, platforms and walkways. Often called sea gypsies this wandering race comes across as jovial and content to exist wherever they happen to land. Personality: Thirvolans are naturally curious and charismatic. They often portray childlike traits and usually have a comical sense of humor. A highly superstitious race, Thirvolans often adopt personal taboos and rituals during the course of their lives. A typical outsiders perspective of a Thirvolan usually evolves from annoyance to endearment in a matter of days as they warm up to these socially adept individuals. Although this does not stop society as a whole from rejecting those that migrate to shore, seeing Thirvolans as second class citizens un-native to the lands of Tharstelding. Thirvolans often seem distracted, aloof and downright inattentive at times. Physical Description: From an outsiders perspective, there is little difference in physical appearance between male and female Thirvolans. Both stand at about three feet and weigh about forty pounds. A Thirvolan appears much like an upright cat, complete with tail and all. They are coated in either long or short fur which ranges in color much like a domestic housecat. In fact the markings of ones fur is often how Thirvolans tell each other apart from a distance. Thirvolans like to dress in the same flashy colors of their boats, often attempting to outdo the most flamboyant of tropical birds. Thirvolans are lean and strongly built for their size, often carrying themselves as though they were shoulder to shoulder with a dwarf. The sense of smell is every bit as important to a Thirvolan as sight, and they often remember the scents of those they care to keep close (or at a distance). Relations: When Kal was a thriving continent Thirvolans lived and wandered about those lands, now they either wander the seas around Tharstelding or settle on the mainland. The Thirvolans that choose the later often have bitter relations with most civilized folk who see them as unwanted migrants. Thirvolans that keep to the seas in their boats or floating cities often find many friends in the form of travelers, sea creatures and merchants. Thirvolans are a matriarch society when they do create pocket communities or when encountered in their floating environs, often obeying the eldest female in a gravitational like manner. Alignment: Even while living in the lands of Kal, Thirvolans opted to execute virtues of personal freedom over society, Chaotic alignments come easy to a Thirvolan. Most Thirvolans are light hearted and lean to the good side of the moral compass. Although their alignments can vary as widely as their multi colored pelts. Thirvolan Lands: Thirvolans hold no lands within the continent of Tharstelding. Small pocket communities sometimes spring up within larger cities, however this is rare due to the nomadic nature of Thirvolans. On the waves surrounding Tharstelding Thirvolans can be found in floating cities made of dozens to hundreds of floating boathouses, platforms and walkways. Religion: Thirvolans mainly worship the five, few pay homage to the Sand God. Religion is not as prominent in the Thirvolans life as in the lives of most other races. Thirvolans are more superstitious than religious, believing in a complicated and personal version of karma. Languages: Thirvolans speak Thirvolan. They also communicate with each other via body language and scent as often as through words. The Thirvolan language sounds much like cat meows and purrs, their alphabet is unique and is comprised of interlocking straight and curved lines. Names: Thirvolans are given one name at birth by their mother, no last name is given in Thirvolan culture. All Thirvolan names are 2 syllables or more, male names often begin with an S, H, R, I or A, whereas female names often begin with a Z, W, K or X. By the time a Thirvolan has reached the age of majority they have developed a title by which they call themselves, it is not uncommon for a Thirvolan to change this title many times over the course of their life. Examples of male Thirvolan names are: Sharaw the Clean, Hwarthaw Blackpaw, Rollio Wall Climber, Ipan the Unlucky and Aerio Goldenmane. Examples of female Thirvolan names are: Zebop Goblin Slayer, Windwallow of Dana, Kika two Tails and Xeya the Blind. Adventurers: The lifestyle of an adventurer appeals easily to the nature of a Thirvolan, when paired with the nomadic tendency of this race there is little reason to question why so many Thirvolans take up the mantle. They often make excellent additions to adventuring groups, working their way into the hearts and minds of their close companions. +2 Charisma, +2 Dexterity, -2 Wisdom: Charming and aloof, the typical Thirvolan makes up in smiles what they lack in awareness. Low-Light Vision: A Thirvolans cat like eyes allow it to see twice as far in starlight, moonlight, torchlight, and similar conditions of poor illumination. They retain the ability to distinguish color and detail under these conditions. See chapter 7 in the core rulebook. Slow Speed: Thirvolans have a base land speed of 20 feet. Small Size: As a small creature Thirvolans gain a +1 size bonus to armor class, a +1 size bonus to attacks, a -1 to CMB and CMD rolls and a +4 bonus to stealth checks. Scent (Ex): A Thirvolans keen nose grants them the Scent ability, see page 564 of the Core rulebook for a description of this feature. Claws (Ex): A Thirvolan has a natural claw attack that deals 1d3 points of damage, plus any strength modifier the Thirvolan might have. As a full round action an unarmed Thirvolan may make two claw attacks at their full attack bonus. If the Thirvolan is holding a one handed item with the other hand free, they may make a claw attack as a secondary attack at a -5 as part of a full attack. A Thirvolans claws provide the Thirvolan with a +2 racial bonus to all climb checks. Languages: A Thirvolan speaks common and Thirvolan. Bonus Languages: Any, as nomadic creatures Thirvolans often are exposed to many languages.